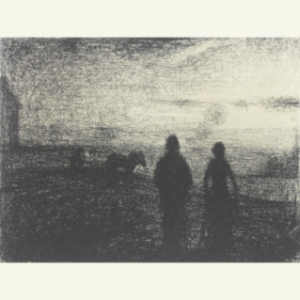 Though Georges Seurat is most often remembered as the inventor of Pointillism, the intricate color system that produced Bather’s at Asnières and A Sunday on La Grande Jatte, his exquisite and little known drawings are considered among his greatest achievements. 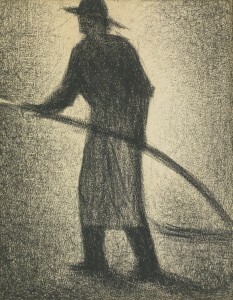 They are distinctive because of his unique method of capturing a serene luminosity of tones by using black contè crayon on Michallet, a handmade french paper. 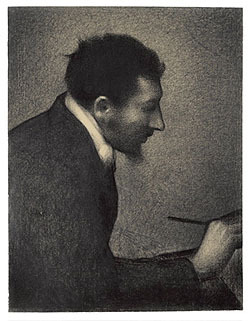 It can also be assumed that in his mastery of tonal values and the stippled appearance of the drawings a matrix was laid for the subsequent pointillist technique that was perfected in La Grande Jatte. The drawing above was recently purchased by the J. Paul Getty Museum in Los Angeles at Sotheby’s London for $3,978,591. It far exceeded the pre-sale estimate of $130,512 – $195,768. 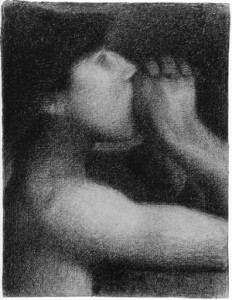 The Getty has no paintings by Seurat but now has four significant drawings made by Seurat. 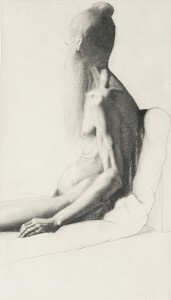 The Indian Beggar is one of his first life drawings and marks a formidable departure from his early classical style as evidenced by the abandonment of the traditional Beaux-Arts contour lines. It was executed during his later years of formal education with Justin Lequien when he had moved from drawing endless plaster casts to live models. The sensitive draughtsmanship in the handling of shadows on the aging folds of skin imbue it with a powerful and original vitality. Seurat’s drawings possess a mystical aura combining intimacy and proximity. He called his technique “irradiation” since it avoided distinct lines and dealt with the subtlety and nuance of light and shadow. 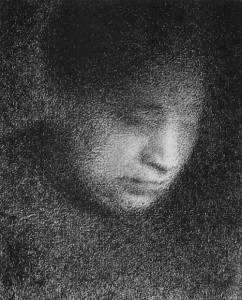 Rather than drawing lines he blackened entire areas of the paper establishing infinite gradations of tone due to the application of the crayon on the textured weave of the Michallet, (see detail above). This produced a range of shades between the whiteness of the untouched paper and the absolute black of the contè crayon. In Edmond Aman-Jean we see how nothing is white except the collar and nothing is black except his hair and the jacket – everything else is shaded. The crayon touches the paper lightly in some places so that the gridded weave of the Michallet creates a luminous stippling effect, which gives it a remarkable atmospheric quality. While the two drawings above served as studies for his large monumental paintings, the majority were done in their own right, constituting a separate body of work. In some of these we can see where Seurat nearly pushed through to complete abstraction. For example, in Child in White (1883-84) and Labourage (1882-83) the forms dissolve and are barely recognizable. At times he seems to explore and play with the ambiguity inherent in the convention of representational art. The contre-jour effect of the silhouetted figures against the setting sun in Labourage float and dissolve in the picture space as does the figure in Child in White. 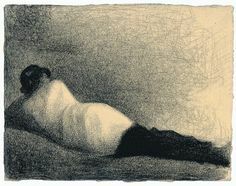 Seurat moves towards abstraction in that he simplifies the forms in a manner that is both realistic and representational. He does this by emphasizing the inherent geometric form and underlying structure of the objects and figures. Another key to this “representational abstraction” is the way he controls and defines light on the subjects. It appears that most of his subjects were lit by a strong light emanating from one source, as seen in Madame Seurat. As an example of part of his market, are two more recent auction sales of his drawings, Liseur and L’Arroseur . 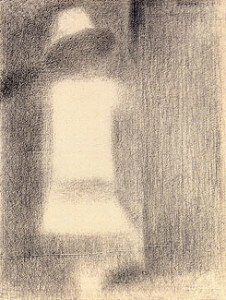 The Museum of Modern Art in New York featured an exhibition of Seurat’s drawings in 2007-08. There is an interesting interactive site where you can further explore his drawings and see his sketchbooks and the conservation work that was done on the drawings. ©2015-2016 J. Slater Fine Art Appraisal and Consultation Services, LLC, All Rights Reserved.